← Is your instructor worthy? My mother was down with food poisoning. Though nearly an octogenarian, she was not content to handle it curled up in a blanket on the couch, as most people even decades younger than her would. 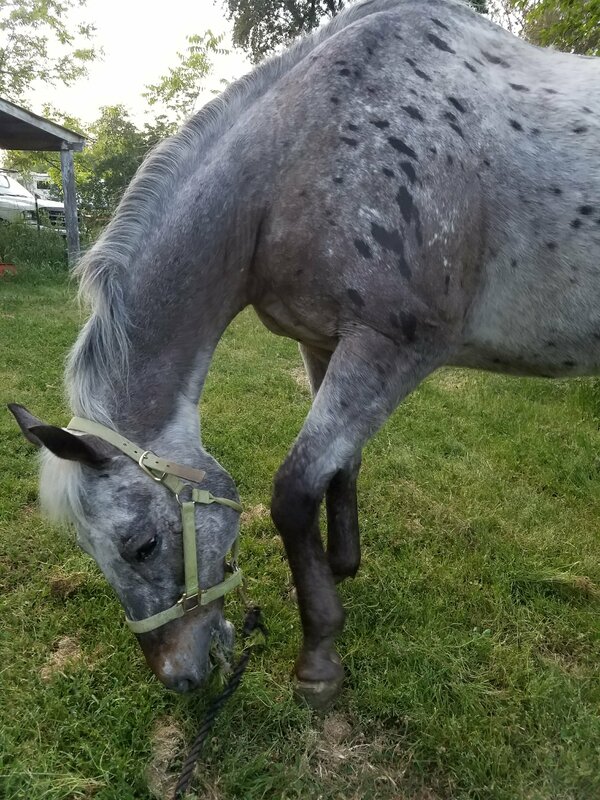 No, instead she was dragging herself out to feed snacks to horses, and texting me complaints about not being “made of iron.” When I got home, she was even out doing the early chores! 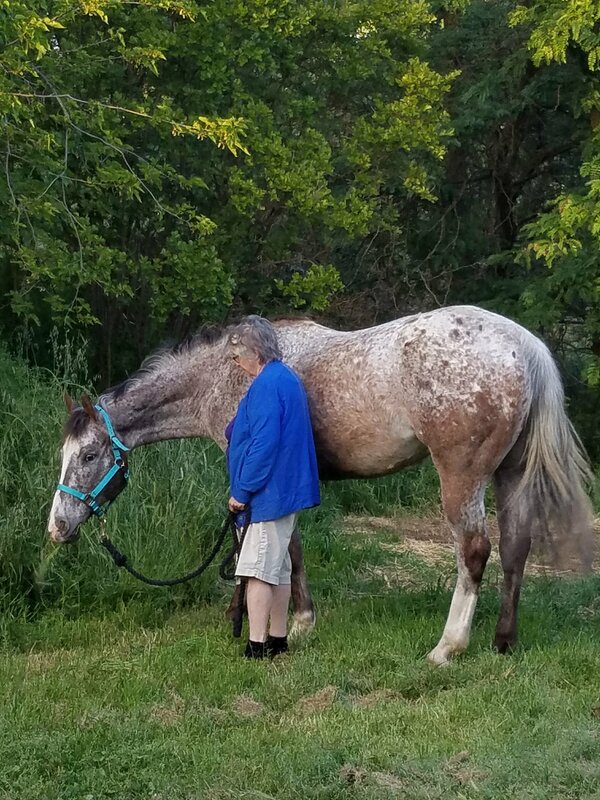 Yep, that’s my mom … Still, she is not made of iron, and the horses were largely ignored, beyond satisfying their hunger. None received exercise, and those requiring turnout had to wait. So it was when I returned home from work. Limited on time and energy, my dilemma was how to best attend to the individual needs of five horses. I contemplated exercising the three who most needed it, but the prospect of working three horses at the end of a long day sapped the last drop of energy I had. Then there was Noble, who had his turnout but has been demanding my attention lately. If I managed to lunge the other three, I would have nothing left for him. So, I faced my dilemma as I walked into the barn and was greeted by five eager faces. The rider in me wanted to work the three horses, to keep their development progressing; but the horseman in me asked this question: what would please them the most? The answer to that was easy – scratches and grass! As in any healthy relationship, what makes them happy, makes me happy – so, I settled on an evening of simply enjoying one-on-one time with each horse. Roxie was the first. After a quick scrub with the curry, it was out to the grass. Roxie is a no nonsense grazer – head down, snatching and chewing. She roams only to the next tasty morsel, so it’s restful for me to just be able to lean on her and listen to the rhythmic munching. Every so often, she’d lift her head from the grass to place her soft nose on me while she chewed. Peaceful bonding time! I was hoping to skip Noble, since he’d had his all-day turnout and grazing, and he takes a lot of energy – but he would have none of it! When I brought Roxie back in, he made it very clear, in posture and voice, that he was to be next! So, next he was. I gave his hide a good scratching, and we headed out front. 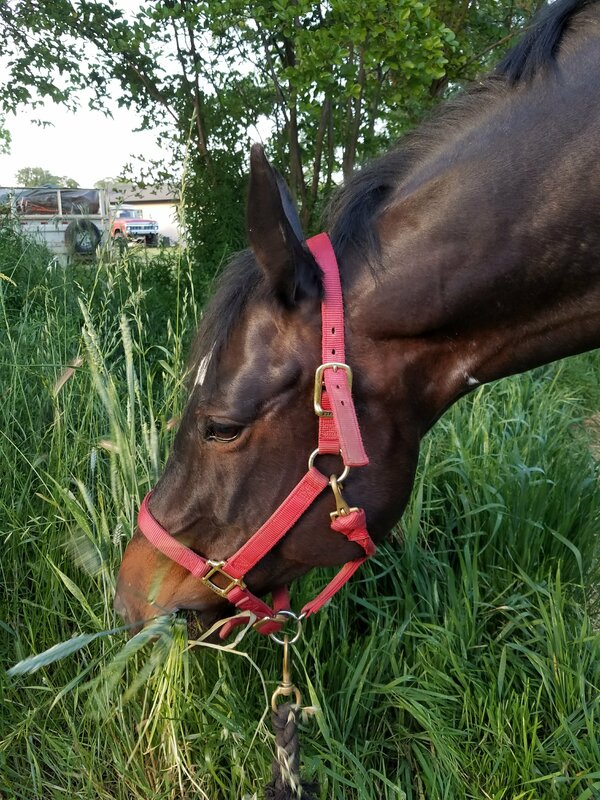 He was more interested in looking around than in any of the grass at his feet – after all, he’d had free access to grazing, thank you very much! So, after a little while of looking around the front yard, he indicted he wanted to go back. After a brief stop to visit Nash and make him squeal, Noble led me right back to the grooming area. More scratching please! Next came Tally. She’s been a bit on edge lately, and we haven’t determined why. So, the first part of her grazing amounted to following her restless movements, as she reacted to any sound around us. Tally is a nervous eater – the more nervous she is, the more rapidly she rips at the grass. 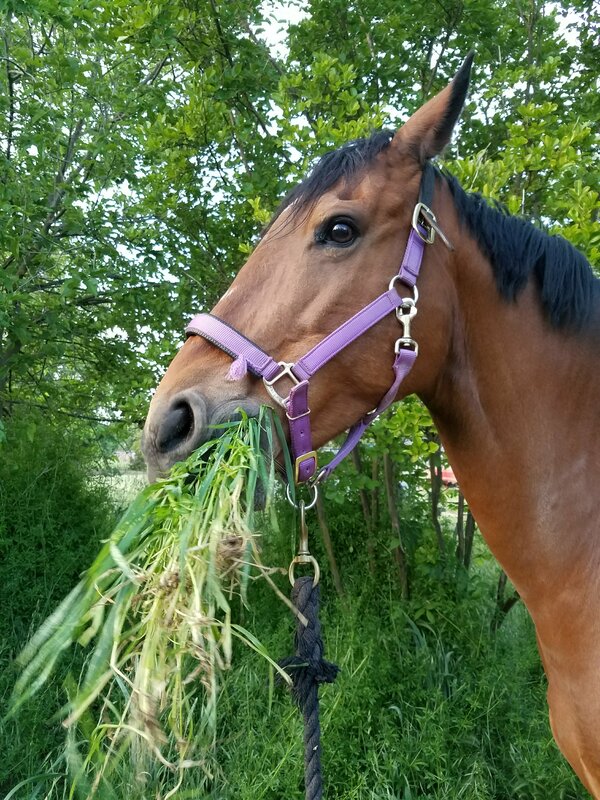 She ends up having to drop half the grass, as she goes along, because she overfills her mouth. After a while, she settled and the grazing became more peaceful. Less walking, more relaxation, and we were both more content. Coffee came next, and it was about that time that my mother made her way out to see what we were up to. When she saw me letting her boy graze she, of course, had to take over. So, I handed her the rope and went in to give Nash some attention. And did Nash need attention! Now that he’s retired, Nash doesn’t get the level of grooming of the working horses (or Mister “Scratch Me” Noble). 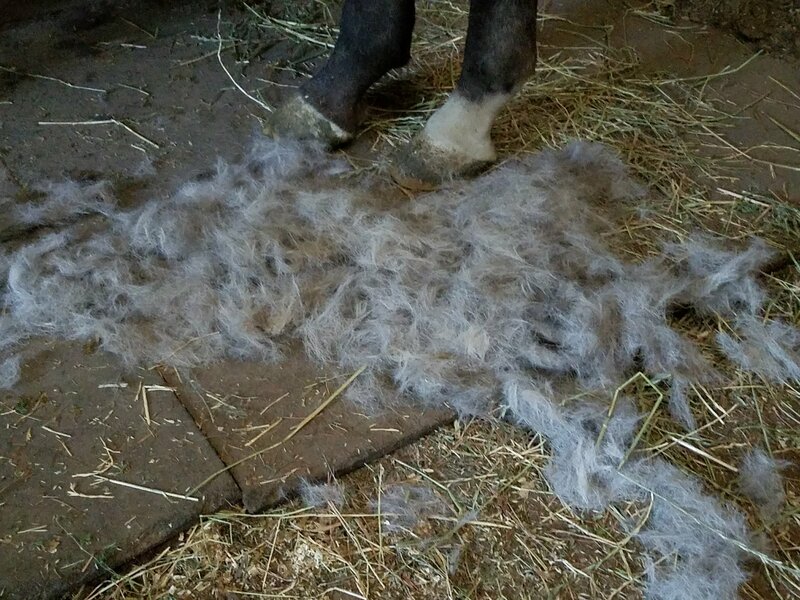 As a result, Nash still had a good bit of winter coat just begging to be removed. So, I got to scrubbing, which he seemed to enjoy quite a bit. By the time I was done, there was enough hair on the ground to cover a small pony! What was left was sleek, but in need of a bath – maybe this weekend. Out to the grass we went, and I soon regretted saving him for last. First, Nash is the most particular horse in the barn. The grass wherever you stop him is never good enough! He must roam around until he finds grass or weeds that meet his quality standards. But don’t get too comfortable! Even when he finds a good patch, Nash is a traveler. Rarely will he offer the same peaceful quiet grazing session that Roxie or Coffee do. No leaning against a warm hide and closing your eyes. Still, it made him happy to be out – and he was clear when it was time to go in. I ended the evening bone tired, yet feeling mentally relaxed and peaceful. The horses seemed equally content, as they waited quietly for their hay. Mom let the dogs have a run around the dusky barnyard, as I finished up by feeding the barn cats and making my way toward the house. No one took any steps forward in their condition or training, but I think we all added strength to our bonds. And, after all, that is at the heart of why I keep these hayburners around! Be good to your horses … and make time to just enjoy each other’s company! This entry was posted in My Journey and tagged Coffee, horse human relationship, human horse bond, Nash, Noble, Roxie, Tally. Bookmark the permalink. Spending time just hanging out with horses is valuable and later in your training the bonds formed will be there to help. Agreed, Anne … and all too often missed or forgotten in our rushed modern world.